Today I'm showing you one of the New Releases from Clear Dollar Stamps. It is the May Stamp of the Month called "A Walk in the Park". Check out the link to the store to see how you can get this stamp set for free! I really had fun playing with this versatile set! Stamps: Clear Dollar Stamps SOM "A Walk in the Park"
I stamped my image using Archival Jet Black onto Watercolor paper, and first stamped my stone wall, then I sponged the sky, then I stamped the trees... avoiding inking the lower part of the trunks on the two smaller trees. I used the leafy stamp to stamp first green leaves and then peachy colored leaves (groovy guava). Next I used one of the tiny stamps to stamp "greenery" along the front of the stone wall. Next I stamped my bench and flower pots, then using the same little greenery stamp I bent it slightly to form the curveed outline of my sitting area. Then I used a larger greenery stamp from the set (actually the stamp that can be used in the flower pots) and stamped some bushes along the front edge. Next, I watercolored the grassy areas and the sitting area using a wet on wet technique, ink in the lids, and finished by dotting little areas with my markers. This is my first attempt at using Flower Soft so be gentle with me.... but this is an amazing product, also available at the Clear Dollar Store. I applied the Flower Soft Glue by just dotting it onto areas of my greenery in front of the wall, and onto the flower pots. After it dried I added a second layer of baby peach to the flower pots to bring them forward a bit. I added Stickles to the trees, grass, bushes and even the flower soft. When my scene was completed I cut it out using my Nesties Label 2 (the largest one). I made my card base out of Old Olive at 5 1/2" square. I cut four Cuttlebug Die Cuts of Lattice plus two corner treatements (see my CDS Words of Gratitude Card for the full corner die cut). I used one of the negative parts from that corner treanment to add just a little diagonal to the top of my lattice work. I cut my DP to fit the center from Memory Box Sweetbay Collection. I adhered everything and mounted the image on dimensionals. I added three butterflies which were a RAK to me from MariLynn (thanks so much MariLynn). I added Stickles to the butterflies and bent their wings, and added Hero Arts tiny crystals to the body of the largest one. I hope you enjoy this little garden scene! This set is so versatile I know I'll have fun playing with it some more soon! Thanks so much for looking and for taking the time to comment! Have a blessed day! Grace this is absolutely gorgeous!! Love the stamp and the the flower soft makes this pop off the page. Ohhh wowwww Grace,what a beautiful card,l love the image and colour. This is so pretty - the scene is so peaceful and lovely. Beautiful, Grace. I have a list I want from CDS and I might qualify for this stamp set. Pretty! I love the flower soft. Wow. absolutely beautiful. Love the lattice look around your border. Great card. I can't wait to get this set too! Grace, this card is absolutely stunning with all the details! Love, love it. Hope you had a Happy Mother's day! Oh, my, Grace...this is the most beautiful card I have seen using the SOM set!!!! The trees look awesome and all the flowers and bushes with the flower soft are soooo fabulous!!! 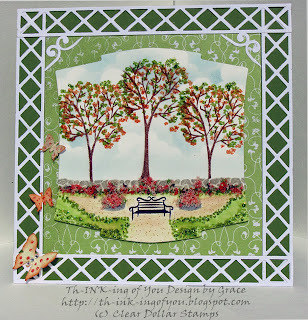 The little park bench looks adorable and I love, love, love the frame your created!!! This is a true work of art!!!! Wow, this is totally gorgeous, Grace! Your Flower Soft looks awesome and I LOVE this scene!!! Oh, I just love the Flower Soft and how you pulled this one together. You are so talented and I feel so privileged to get to keep up with your beautiful work!